I’m sure you won’t be too surprised to find out that I keep a collection of short stories in my husband’s car. If we’re stuck in traffic, I’ll pull it out and read a story aloud to him (my brother-in-law, Sweater, will be happy to know that the collection that currently lives in the car is one of Sedaris’s). If we’re headed on a long road trip, I usually download a short-story collection onto my iPad, so I can read them aloud as he’s driving. I am not a fan of driving, and he is not a fan of reading, so it works out well. They’re stand-alone (If we read a couple stories on a road trip but don’t finish the book, the rest of the stories can wait until our next trip. No need for plot or character refreshers when we return to the book weeks or months later). 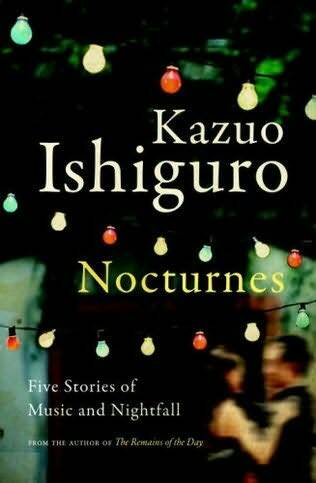 Our latest road-trip book was Kazuo Ishiguro’s first collection of short stories: Nocturnes: Five Stories of Music and Nightfall. As the subtitle suggests, Nocturnes is a thematic collection. The stories are linked not only by subject matter but also occasionally by a recurring character. All of the stories are about music, usually focusing on a musician (or a few musicians). But these are not upbeat stories about happy music and optimistic musicians. There is a thread of loneliness, regret, missed opportunity, and sadness that connects the five stories. Ishiguro is the author of Booker-Prize winner The Remains of the Day (on which this movie was based), as well as the fantastic Never Let Me Go (on which this less-than-fantastic movie was based). So, I had high hopes. I don’t think his short stories are as strong as his full-length novels. Bryan and I both thought they were well written and objectively good but not very fulfilling. And, because the stories share so many similarities (music and sadness are present in each of the five stories, and they are all narrated by dudes with very similar voices), they were a bit repetitive and monotonous. Who should read it (according to Bryan): Weber (i.e., people who are really into music). One final thought: Ishiguro’s Never Let Me Go is a book that is difficult to summarize without being spoiler-y. So, on faith, trust me when I tell you, if you haven’t read it already, you should. This entry was posted in Rating: 3/5 and tagged Book review, Books, Kazuo Ishiguro, Nocturnes, Short stories. Bookmark the permalink. Nice job. Agreed with regard to the Never Let Me Go movie being a total disappointment. The book was well worth the time and investment. Given you penchant for short stories I’d like to make an unsolicited recommendation: The Complete Stories of J.G. Ballard. Perhaps best known for his Crash (an over rated movie imo) and Empire of the Sun (a very good movie, especially the score and cinematography), his stories are delicious. It would be unfair to call them sci-fi-ish although some of the stories are clearly set in what may be thought of as sci-fi type settings. I’d say they have a more dystopian bent than ‘pure’ sci-fi and reflect deeply on the traumas wew all suffer in this life. Some may remind you of Borges. IN any event, it may be worth a look. 600 or so pages – but with Atlanta traffic . . . Thank you for the unsolicited, but nevertheless appreciated, recommendation. I have added it to my list. Based on your description, it sounds like something we would enjoy. I will let you know if we find them to be as “delicious” as you claim (but you’ll have to wait at least a couple of years for us to get through all TWELVE HUNDRED pages).